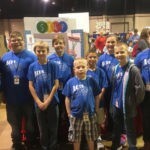 The Adair County School District sent four teams – one from each school – to the Student Technology Leadership Program (STLP) state competition Wednesday at Rupp Arena in Lexington, Ky. All four schools gave impressive presentations, and Adair County Primary Center’s project earned a top-10 finish out of more than 578 entries. ACPC presented a YouTube video, “12 Easy Ways to Save the Planet” which was written, directed, and produced by students and featured simple conservation ideas. Thus far, the video has been viewed almost 1,700 times and has received comments online from viewers in 41 states and 17 different countries. 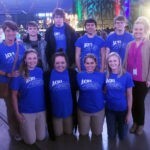 Students participating in the competition Wednesday included, from ACPC: Addie Baker, Gabe Coleman, Sofia Coleman, Jasper Kemp, Alayna Marcum, and Lilly Myers. 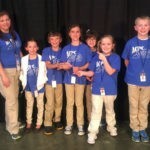 From ACES: Brody Blair, Abby Claywell, Jack Fishback, Dillon Godsey-England, Rylee Godsey-England, Jordan Grider, Malakai Horton, and Mason Horton. 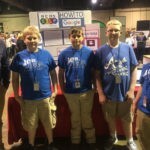 From ACMS: Ian Grant, Hayden Hancock, Coleton Wall, and Chad Wiley. From ACHS: Trevor Cowan, Katherine Curry, Sara Dunbar, Chloe Hixson, Maddie Loy, Tyler Miller, Roberto Ramirez, and Erwin Ruczienski. Coordinators in attendance included Marcum (ACPC), Sarah Dean (ACES), Adam Cox (ACMS), Katie Curry (ACHS), and Jenny Myers (ACHS).